This paper was prepared after the tragic death of Florence Richard, the day of her 50th anniversary. Florence practiced cytogenetics during all her professional life. She started working on cancer, at the Curie Institute in Paris, where she got her PhD. 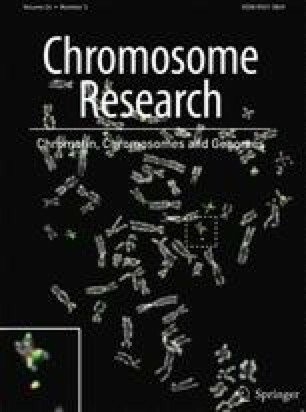 In addition to her teaching activities, she became expert in fluorescent in situ hybridization in early 1990s and participated to the publication of a book on molecular cytogenetics, with M. Muleris, F. Apiou, and B. Dutrillaux. She rapidly applied her competences in comparative cytogenetics and moved to the Muséum National d’Histoire Naturelle of Paris in 2003. A large part of her comparative cytogenetic papers were published in Chromosome Research and Cytogenetics and Genome Research. Her last research activities, focused on Laonastes aenigmamus, are reported in the above paper. Florence Richard will remain as a very sympathetic person, with multiple human interactions, in the domains of both teaching, at the University of Versailles-Saint Quentin and research at the Muséum National d’Histoire Naturelle. Since November 12, 2008, the conservation of L. aenigmamus is regulated in Lao PDR. This species was listed as « Endangered » on the IUCN Red List in January 12, 2009. To perform this study, we obtained an authorization (no. 1183 June 09, 2008) from the Lao Government. In December 2008, March 2009, and November 2009, 2010, and 2011, five sampling field trips took place in the Khammuan Province in collaboration with the Lao National Agriculture and Forestry Research Institute (NAFRI). The Khammuan Province Agriculture and Forestry Office (PAFO) validated our field collection schedule, and an officer escorted us. Almost all the specimens used for this study were dead animals, captured by traditional hunters. For the few animals captured by us, all institutional and national guidelines for the care and use of laboratory animals were followed, in agreement with the American Society of Mammalogists (Sikes and Gannon 2011).